This page is open for members to share articles, photographs, sightings, up-coming events or other information that might be of interest to members. Material can be forwarded to Gwen Klebeck (mklebeck@skyvelocity.ca). All articles must be referenced - whether it is a photo taken by yourself (preferred) or articles from another source. The presenter for the evening was Jim Bahr. Jim did a very interesting presentation on bat echolocation. Bats emit calls out to the environment and listen to the echoes of those calls that return from various objects near them. They use these echoes to locate and identify objects, thus using them for navigation and foraging. Most bats echolocate at a frequency greater than 20,000 hertz (20kHz). The highest frequency humans can hear is lower than 20 kHz. A person over the age of 20 might not be able to hear a frequency over 17 kHz. Most speech is less than 5 kHz. Jim demonstrated how, by downloading a smartphone app, we can capture the bats’ ultrasonic calls and record their sonograms. This app translates the bat calls down to a frequency humans can hear. Next spring, if there is interest, we plan to do a bat walk in downtown Prince Albert, locate some bats and determine what species they are. Saskatchewan has 8 species of bats residing in the province, and we might find 4 or 5 in the Prince Albert area. On November 4, 2016, we had a small group gather to view the night sky. We were fortunate to have the expertise of meteorologist, James Schofield. It was a cool, clear evening dipping down to -3 degrees C, a perfect evening for viewing the moon and stars. With the assistance of James and his telescope we saw a close-up of the moon nearing the first quarter phase, Mars, the North Star (Polaris), Little Dipper (Ursa Minor), Big Dipper (Ursa Major), Seven Sisters (Pleiades), Cassiopeia, Andromeda Galaxy, Double Cluster, M13. Orion was beginning to appear on the horizon when we decided to call it a night after close to 3 hours of gazing. We found the evening so informative and exhilarating that we plan to do it again in 2017. Hamilton Greenwood presented a collection of recent photos of his journeys in Saskatchewan and Alberta as well as a recent trip to Norway. He titled his presentation ‘Meanderings and Musings’. The photos were beautiful and the stories that went with them entertained us for close to an hour. Hamilton is now vice-president for Nature Saskatchewan and consideration is being given to hold the 2017 Spring Meet at Candle Lake. A show of hands indicated there is considerable interest in helping put together a fun and informative weekend from June 2 – June 4, 2017. Since this award was bestowed, Harold and his daughter, Shelly, have volunteered as regional coordinators for the recruiting of volunteers and collection of data for the Saskatchewan Breeding Bird Atlas project. This is an important new project in wildlife research in our province. According to Dr. Kiel Drake, the Saskatchewan Program Manager for Bird Studies Canada, the Saskatchewan Breeding Bird Atlas will be a “contemporary assessment of the distribution and relative abundance of all breeding bird populations within Saskatchewan.” The initial project website can be viewed at sk.birdatlas.ca. The meeting was opened by Jim Bahr. Eight people were present: Jim Bahr, Sandra Jewell, Gwen Klebeck, Milly Fillmore, Alan Porter, Collin McGuire, Marie Braaten, Gerald Murphy. Jim has been doing some work in forensic entomology and will give us the address to a fascinating website. An example of this is the work of Gail Anderson from Simon Fraser University on how to determine time of death through the use of maggots and their life cycle. We hadn't collected membership fees for a few years, and we decided to do that for the year September 2015 - September 2016. Jim showed a short film on the amazing capabilities of Kanzi, a Bonobo Ape. Through training, Kanzi can start a fire with branches and matches and cook marshmallows on a stick. He knows sign language and is able to assist with cooking in the kitchen. Collin McGuire asked for feedback around the idea of starting a Nature PA Facebook Profile. It would enable us to access other nature groups on Facebook without having to have Facebook ourselves. There was some interest and Collin will get more details. Meeting was adjourned at 9:30 pm. In the fall, the snowy owl makes an annual pilgrimage from its summer nesting grounds in the Arctic to south of the Boreal Forest in Canada. The snowy owl seeks a more hospitable climate and better supply of food in southern Saskatchewan. So where in Saskatchewan do these owls spend the winter? During the Christmas Bird Count in the Prince Albert area, a small number of snowy owls often showed up on the count. This occasional observation of owls is a similar pattern from the south edge of the Boreal Forest, just north of Prince Albert to just south of Saskatoon. On a trip from Saskatoon, only three snowy owls were observed between Saskatoon and Rosetown. Rosetown is just south of Saskatoon, and in that area, snowy owls are sparse over the winter months. Between Rosetown to Saskatchewan Landing Provincial Park, fourteen snowy owls were observed. The area between Rosetown/Outlook to the South Saskatchewan River has usually been the area of higher concentration of wintering snowy owls. South from the Saskatchewan Landing to Swift Current and then NW to Cabri, zero snowy owls were observed. Typically, we would see one or two owls travelling south of the river. On previous trips through this area, I have seen patches of good numbers of owls, but typically scattered. A couple of years ago, during the Christmas Bird Count at Cabri, a good number of snowy owls were counted in a radius of seven miles from Cabri. I have observed this pattern of owl sightings for many years. The challenge in observing any owls south of the river is primarily due to the lack of telephone and power poles along the major highways. With the lack of tall structures, owls will often be perched on rock piles, fence posts or stacks of bales. The owls may be there, but just not observed on this trip. Early spring will see the owls making their way back to the Arctic to rear another crop of owlets. Often, juveniles will hang around in the south and make a more gradual trip northward. Juvenile male and females are quite similar in appearance and resemble the adult female. The adult female has a checkered black and white plumage, while adult males are primarily totally white. We held an informal meeting with the knowledge that our long time, dedicated leader, Carman Dodge, has stepped down from the position of president of Nature Prince Albert. We hope Carman will continue to attend our meetings and events and continue to share his wealth of knowledge and expertise. The meeting opened at 7:30 p.m. with everyone present introducing themselves. This meeting was designated as 'bring a guest' evening; therefore, there were some new attendees. Gwen Klebeck introduced Ron Jensen from Saskatoon and Ron did a presentation on his recent trip to Equador. His photographic narrative was thorough and varied, profiling some of the Equadorian local people, providing a snapshot of city life, country life and many interesting birds and animals. Ron stayed after the presentation to answer questions and provide more interesting facts about his trip. Ron also shared the fact that he has recently become authorized to band hummingbirds, the only person in our province allowed to do this. The meeting adjourned at 9:0.0 pm. Carman Dodge called the meeting to order at 7:30 p.m.
Plans Program: Jim showed the videos The Story of Bottled Water (2010) and The Story of Stuff. · Donations for silent auction from Nutters, Marks Work Warehouse, Diamond North Credit Union, Ricky’s Bar and Grill, Boston Pizza, Fresh Air Experience. · Wrapper Jacks will do bag lunches for the tour at $10 each. Jim and Carman arranged an executive meeting for March 7 in order to open a sub account for the spring meeting. The minutes of the meeting are attached. Carman and Jim spoke about birding at Cuelenaere Public Library on the evening of March 13. They received a good reception. An evening owling in Prince Albert National Park is scheduled for April 12. A one-hour drive to the site where you will see plants of a bog and the neighbouring forest: seaside arrow grass, equisetum, labrador tea, bog violets, lapland buttercup, fringed milkwort, orchids, insect eating plants (round and narrow leaved sundews, pitcher plants) bog birch, saprophytic (Indian pipe), lady slippers, and marsh marigolds. Plants found on the upland trail: puccoon, sweet grass, heart-leaved alexander, solomon’s seal, meadow rue, bearberry and cranberry. South west of Prince Albert on #11 Highway (Louis Riel Highway) between the Macfarlane River and the railway line. The short walk in dry footwear takes approximately 10 minutes if you and your guide aren't stopping to see roses and posies. One pagewire fence, railway tracks and then a barbwire fence and help from your neighbour gets you there. The closer you get to the bog, you will hear white-throated sparrow, ovenbird and grosbeaks and hawks screeching overhead. The darkness also brings dampness and different flowers: marsh marigolds, bishops cap, pink and green wintergreen and frogs swimming in the holes left behind after a tree has fallen over. The first view as you leave the darkness is a sea of blue violets. Walk carefully, for moose have trod before and left deep holes. Don't worry about getting wet feet. That is why you brought dry shoes and socks and left them at the van. Rubber boots only fill up with water. Old running shoes are best. Have fun and be a child again. Your mom won't give you heck for getting your boots wet. A one-hour drive across the Fenton Ferry to Jumping Lake and explore the headwaters of the Carrot River. Lead by two folks with over 40 years of Breeding Bird Surveys under their belt, be prepared to see and hear birds. Bring binoculars. Stop #1 is the Fenton Ferry which crosses the South Saskatchewan River southeast of Prince Albert. Not only a scenic crossing, but a good spot to see American white pelican, turkey vulture and possibly an osprey nesting. In the spring of 2010, a pair of osprey tried nesting on the pulley assembly on the cable above the ferry. Stop #2 Jumping Lake. Located approximately 13.5 km south of Birch Hills, Jumping Lake is an internal basin with no outlet; therefore, even in the driest years, it contains water. Common loon, red-necked grebe, white winged scoter, American avocet, and forester's tern are regularly seen. In May, 1983, a flock of 60 whimbrels were observed and photographed at the northwest corner of the lake. Stop #3 Dixon Lake. Located east of #20 Highway, north of Crystal Springs, Dixon Lake is located along the Carrot River. Until recently, this lake had received little use by people; however, like many smaller lakes in Saskatchewan, Dixon Lake has recently been developed for cottage subdivisions. A bald eagle has nested at the east side of the lake for several years. Virgina rail, marsh wren, pileated woodpecker, and great crested flycatcher are possible sightings at Dixon Lake. This is a relatively flat area for walking. Wear proper footwear. This area is mostly open, so you may need sunscreen. In 2006, during Nature Sask Meet, this tour to a recent forest fire was witness to new growth. Now return to the same sites to see what nearly a decade has regrown. Six sites to visit. Stop #1 Area of jack pine forest that didn't burn. Chance to see rams head ladyslippers, spotted coral root, sweet scented bedstraw, mosses, green flowered wintergreen and roses. Note the temperature changes at all sites. White-throated sparrow should be common. Stop #2 A firebreak, a break in the forest canopy, that was in place prior to the fire. Firebreaks are designed to bring the fire down to ground level and easier to fight. No trees are present, but pussytoes, milkweed, spreading dogbane, blue-eyed grass, and strawberries are some of the vegetation that is growing in this site. Stop #3 Plantation site. One side of the road is a plantation that the fire went through. The other side of the road was untouched. This plantation was part of a mistletoe control project. Because of the open site, clay-coloured sparrows and white-throated sparrows are present. Stop #4 Standing dead jack pine with trembling aspen. Where did the aspen come from? Stop #5 Wet site that burnt. See what happened here. The least flycatcher flies from snag to snag. Canada thistle and coltsfoot grow on the wet site. Stop #6 Abandoned railway bed and regenerating burn. Northern bog orchid, scorpion weed, and baneberry grow amongst the strawberries and red clover. Nighthawks, phoebe, swainson thrush and veery sing their tuneful tunes. TOUR #4 DANCE WITH DAVE THE DRAGONFLY SLAYER. Learn how, with epee-like manoeuvres and swooping your net, to capture the elusive darner, baskettails, or bluets. Walk among the wetlands and see the amazing capabilities of these winged warriors in flight. And, if you are lucky, watch the Odonata snack on a mosquito or a tasty horsefly. Learn how to photograph a dragonfly. How do you tell the difference between a male and female dragonfly? How many species do you think are out there in Saskatchewan? This will be a wet site for walking, so wear appropriate footwear. Your leader, Dave Halstead, is our guest speaker for Saturday evening’s banquet as well. This small boreal forest owl was once thought “uncommon.” Now, with new techniques, they are not so uncommon and are found to be migratory as well. Learn about banding or “ringing” as some other countries call it. Find out how bands are placed on the birds. Why do we band or mark birds? How heavy, how big, what other data is collected when banding these critters? Learn this and see some wildlife up close. Your leader has requested that only small groups can be handled at a time. One van load of 12 people. Christmas Bird Counts of 2011-12, I saw a "lifer" bird – lifer meaning never having seen before. The bird was a Gray-crowned Rosy Finch. Only one bird, but a real beauty to be seen. The GCRF, as called by birdwatchers, was recorded at the Cabri Regional Park. It was keeping company with Common Redpolls – CORE. The park is located along the west end of Lake Diefenbaker, nestled at the bottom of the river valley near the town of Cabri - a busy park with over 100 sites. Five GCRF were recorded during this year’s CBC across Saskatchewan. Another highlight was 30 Eurasion Collored Doves mixed in with Rock Pigeons near the town’s elevators – the first time they were recorded in Cabri. The ECDO, I have seen while holidaying in south-east Arizona, which is a birdwatcher’s paradise. Carman Dodge, Marie Braaten, Gwen Klebeck, Elsie Janzen, Gerald Murphy, Ruth Griffiths, Millie Fillmore, D. Wood, B. Wood, Hamilton Greenwood, John and Pam Burt, Keith Routley, Lillian Leduc, Brenda Parenteau, Landon Parenteau. President Carman Dodge called to order the meeting at 7:30 p.m. He introduced Hamilton Greenwood of Prince Albert who presented a series of his recent photos. He titled his presentation To Everything There is a Season. His photographic walk through the seasons captured a wide variety of images of birds, deer, foxes, clouds, trees, ice and many more aspects of the province’s ecosystems. Harris sparrows and juncos reported in the vicinity. Gerald Murphy and Carman Dodge took separate trips to Muskki Lake to view whooping cranes — 17 adults and two young about half a mile from where they were viewed last year. They were by themselves… no other cranes. A couple from Calgary reported 38 were in the area between Dana and Humboldt. Harold Fisher who lives 20 minutes north of P.A. in the Nisbet Forest is looking for volunteers to assist him with banding Sawwhet and Boreal owls, 8 p.m. to midnight. He has banded a Long Eared Owl. The museum has a painting by Harold Towell that portrays a heron in the pose we use for our logo. It would cost $100 to frame the photo that would hang in the museum. In June 2012 Nature Prince Albert will host the Nature Saskatchewan spring meet. Some members will need to take help organize this event. Already, Keith Dodge has secured a $100 donation to sponsor a coffee break. Will need silent auction items. Nov. 15 – TBA, possibly someone from Parks to present information on the proposed Emma-Anglin Lakes Park. Jan. 14 — daytime outing to Prince Albert National Park. Feb. 21 — Jason Nelson, geology of N. Saskatchewan. June 15-17, Nature Saskatchewan Spring Meet at P.A. Exhibition Centre. Banquet speaker Dave Halstead presenting his new book Dragonflies and Damselflies in the Hand. Adjournment: Carman adjourned the meeting at 8:30 p.m.
Carman Dodge, Fred Routley, Alan Porter, Sharon Dice, Ruth Griffiths, Linda Fornal, Marie Braaten, Jim Bahr, and Derek and Barbara Wood. President Carman Dodge opened the meeting at 7:30 p.m. and introduced the speaker, Jim Bahr, a member and a wildlife instructor at SIAST. He spoke about Urban Wildlife, illustrating his talk with photos and video. On the saskbirds.com website, report of cardinals (pair and 4 juveniles) near P.A. municipal golf course this fall. This is a rare sighting. No reports of large flocks of whooping cranes this fall. Harold Fisher, (922-1363) who lives 20 minutes north of P.A. in Nisbet Forest, is looking for volunteers to assist him with banding Saw-whet and Boreal owls. He banded a Long-Eared Owl recently. Banding starts around 8 p.m. and can go past midnight. Oct. 16, field trip for waterfowl watching to Waterhen Marsh, Jumping Lakes Dickson and other lakes of the area. Dress warmly and bring a bag lunch to eat at Struthers Lake Regional Park. Carpool. Will phone. Jan. 14, daytime outing to Prince Albert National Park. Jan. 17, members' night and speaker TBA. Results of park trip. June 15-17 Nature Saskatchewan Spring Meet at P.A. Exhibition Centre. Tours, silent auction items, sponsors and a banquet with guest speaker Dave Halstead presenting his new book on Dragonflies and Damselflies in the Hand. Will need a list of accommodations, including the camping sites at the Exhibition Grounds. Rooms book and caterer contacted. Plan to use smaller vans rather than big bus for tours. Adjournment: The meeting adjourned at 9 p.m.
Jim Bahr, a member and a wildlife instructor at SIAST, was the speaker at the Sept. 20 meeting of Nature Prince Albert. He spoke about Urban Wildlife, illustrating his talk with photos and video. Striped skunks are a major carrier of rabies in Saskatchewan. (The second highest incidence is in cattle.) There has been a recent outbreak of rabies in skunks in the Prince Albert area. The other major threat from skunks is being sprayed. Skunks den under sheds, porches and decks. A skunk may have several dens, but they consolidate their dens in the fall. The juveniles disperse in the fall; many die on highways. Skunks may destroy beehives in the spring. They dig for grubs and eat garbage, insects, fruit, grain, rodents and bird eggs. Skunks are not very aggressive. Give it space to get away. Fall is a good time to trap skunks because they are congregating and they are hungry. It may be more humane to kill the trapped skunks than to release them into unfamiliar territory where they will be killed by predators or on the highway as they try to return to their home territory. Raccoon are becoming more common in this area, although not a major problem yet in the city. They are becoming more aggressive and are very common in some urban areas, such as Toronto. It has the widest geographical range of any animal in North America. The raccoon may be the animal most suited to urban living. Its basic requirements are a) den site; it prefers trees, b) permanent water supply, which could be a bird bath, c) available food. It eats almost anything. Raccoons are an increasing problem across North America. Wildlife management is really people management. Raccoons carry a nematode that can infect humans. The worm eggs are not destroyed by bleach. They must be heat killed, such as in hot water or torching soil. Porcupines are not usually a problem in urban areas. They eat bark off trees in winter, so they can be a problem in parks. The coyote is the number one bane of livestock producers, so it makes a lot of enemies. It is very adaptable. It learns to use different and varied food sources. It will watch and wait, learning about the habits of potential prey such as pets. Coyotes eat hares, rodents, lambs, carrion and animals as big as deer. Badgers are generally not seen in urban areas. Beavers block culvers, mainly in the countryside. They cut down trees in parks. Muskrats dig into banks and may dig along roads, thus causing them to collapse. Pigeons chase away other birds at the feeder. To get rid of the pigeons you have to remove their food source. Stop filling your feeders and convince your neighbors to stop feeding the birds. May take two weeks before pigeons go away. Ruth Griffiths, John Burt, Fred Routley, Gerald Murphy, Keith Dodge, Jim Bahr. There being no quorum, the meeting was held informally. Decisions must be ratified at the next regular meeting. Spring bird sightings: John's daughter saw a Blackburnian Warbler in Prince Albert May 17. Keith saw canvass back north or Prince Albert. Hummingbirds are back. Important bird areas: None in our areas. Jim will contact coordinator Deanna Trowsdale-Mutafor. We might organize a trip to Buffer Lake. Treasurer's report shows revenue of $550 and expenses of $381.61. Balance as of May 17 is $3356.13. Report and summary of website expenses attached. Newsletter: Ruth said 30 of 40 newsletter subscribers are receiving it electronically, resulting in savings of $18 per newsletter. All executive and board members have agreed to stay on in their positions. Keith has resigned as treasurer. He will stay on until another treasurer signs on. Future meeting topics: Jim Bahr will prepare a talk on Urban Wildlife Management. He is also planning to do something with a bat detector and recordings. Our goal was to hear owls responding to our calling. Numerous efforts were made in a variety of habitats, but no owls were heard. But, the trip was not in vain. Our winter-resident raven and magpie were common. The early spring migrants were recorded: Canada goose, crow, red-tailed hawk, great blue heron, bald eagle, mallard and the common goldeneye. Muskrats were active along ice edges with open water. Six river otters turned out to be the highlight of the trip. They entertained us for some time. The clear cool evening with a multitude of stars and the dancing northern lights added to the trip. 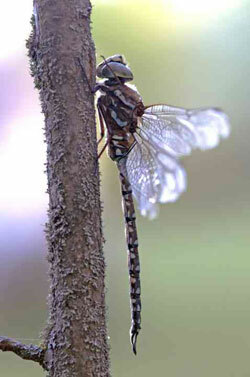 Dave Halstead provided an up-close look at dragonflies and damselflies at the March 15 meeting of Nature Prince Albert. His excellent photographs illustrate Dragonflies and Damselflies in the Hand, the new book, currently in press, that he has authored with Gord Hutchings. "Dragonflies and damselflies push the limits of form and function more so than any other insect group," he proclaimed confidently as he began his informative and entertaining presentation. The fossil record for dragonflies goes back 325 million years to the Carboniferous. They predate dinosaurs by 150 million years. They have survived several mass extinctions and haven't evolved a tremendous amount. "They have managed to keep a winning combination of features." Odonata is an order of insects encompassing dragonflies (Anisoptera) and damselflies (Zygoptera). Generally speaking, at rest dragonflies hold their wings out to the side and damselflies hold their wings closer to their abdomen. Damselfly eyes are separate whereas dragonfly eyes may be almost joined at the top. Body and wing markings are also used to differentiate species although a hand lens may be necessary to identify some. They live as larvae for one to three years in aquatic environments. They are predators, living in the mud eating fish, tadpoles, mosquito larvae and other insects. The dragonfly larvae have no gills; they breathe through the rectal cavity. After they morph, the adults live, on average, six to eight weeks. They have large composite eyes that can see in almost all directions. There can be as many as 30,000 elements on the eye. Dragonflies have very large flight muscles. Their four wings move independently. "They can change direction on a dime." Eggs are deposited into water or aquatic vegetation. They hatch out and overwinter in the water. Odonates are tropical in nature. They go dormant for the cold months. "They eat all the things we hate: mosquitoes, black flies, deer flies… They eat 15 per cent of their body weigh each day, and can eat up to 70 per cent." 1. Odonates are great environmental indicators. The Prairie Forktail had not been found in the boreal forest but is starting to be seen at LaRonge and Creighton and north of Edmonton where never seen before. The Common Green Darner is migratory, hatching in the north and moving to the south of the province as adults. They are a good indicator of a healthy water body. Cast skins are collected to get an idea of how many larvae are surviving into adulthood. They have a preference for a particular type of vegetation. 2. Get insight into insect behaviour. They are larger, therefore easier to observe than some of the smaller insects. They are, however, hard to catch. Kit needed for field work: net, close-focusing binoculars, small envelopes for holding insect safely, hand lens. Odonates have a long genetic history. There are 5,680 species which dragonflies and damselflies on almost every continent. 10% of species are near extinction. We have almost no information on 35% of the species. They are an important link. They are a major predators and a major prey species. They are eaten mainly by birds. Attendance: Carman Dodge, Gerald Murphy, Sharon Dice, Marie Braaten, Fred Routley, Ruth Griffiths, Jim Bahr, Pam and John Burt. Jim Bahr showed two National Film Board of Canada productions showing the traditional winter and summer lifestyle of the Inuit of Pelly Bay. The films were titled The People of the Seal. Carman said the feeders at Little Red River Park and South Hill Cemetery are well used. He noted a goldfinch and a Great Horned Owl recently at the cemetery. Jim said March 22 is World Water Day. Films will be shown at JMC Library. Carman offered to lead a day trip to PA National Park upon request. Gene Slager projected photos taken while on a solo canoe trip on the North Saskatchewan River in July 2010. He paddled from the Alberta border to Prince Albert, approximately 475 kilometres. The eight-day trip was broken into two weekends. Sharon Dice won a framed picture donated by Keith Dodge. Carman circulated copies of the results of the 2010 Christmas bird count. Number of species was down but overall numbers remain similar. The Feb. 15 meeting will be in a different room at SIAST, room AC234. Jim Bahr will show videos. Attendance: Hamilton Greenwood, Lorraine Brokop, Fred Routley, Nancy Kennedy, Ruth Griffiths, Elsie Janzen, Milly Fillmore, Michael Newman, Keith Dodge, Carman Dodge, Rahcole Spence, Marie Braaten, Harold Fisher, Gerald Murphy, Pam and John Burt, Barbara and Derek Wood. President Carman Dodge called to order the meeting at 7:30 p.m. He said Kevin Carr was unable to do his presentation at the meeting and may present at the February meeting. 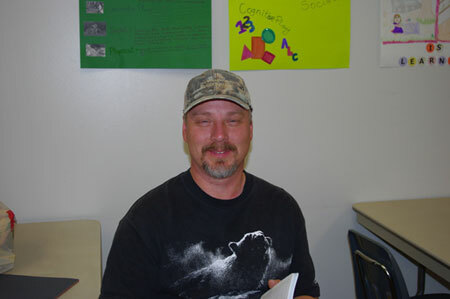 He introduced Nancy Kennedy of Prince Albert who was substituting for Karen McIver of Nature Saskatchewan. Program: Nancy presented information about Important Bird Areas (IBA). She said one in eight bird species is threatened with extinction. Birds are well documented and are indicator species. Caretakers are needed for the 110 IBAs in Saskatchewan. Individuals or groups visit the designated area at least annually and submit a report form. They advise of any conservation threats to the IBA. Keith is making and selling three-legged tray feeders for $10 on behalf of Nature Prince Albert. Carman attended a full day Shore Gold Environmental workshop on Oct. 26. It was attended by Ministry of Environment, Reeves of the RMS and a few other interest groups. It was quite informative. On Nov. 6-7 Carman observed two rare ducks at Blackstrap Reservoir: Longtailed Duck (formerly Oldsquaw Duck) and Barrow's Goldeneye. Dec. 14, Bird of Christmas. Prepare for the Christmas bird count to be held Dec. 19. Jan. 18, Gene Slager will talk about his solo canoe trip on the Saskatchewan River. It is also Members' Night. February maybe Kevin Carr of the Canadian Wildlife Service will talk about Convention on International Trade in Endangered Species of Wild Fauna and Flora (CITES). Attendance: Jim Bahr, Sharon Dice, Doris Town, Orpha Hunt, Lorraine Brokop, Christine Simpson, Gerald Murphy, Barb Wood, Ruth Griffiths, Michael Newman, Carman Dodge, Keith Dodge, Fred Routley, Pam Burt, John Burt, Shirley Swain, Jeff Gooliaff. Program: Gooliaff said Dutch elm disease was first identified in the province in Regina in 1981. It is a fungal disease spread by spores carried by three different elm bark beetles, from tree to tree along the root systems and by human activities. The fungus blocks the movement of water and nutrients, causing leaves to wilt. It can kill the tree within three weeks, but may take several years to kill the tree. There is no cure. The infected trees must be destroyed. Landowners are responsible for removing infected trees. The trees can be tested at no charge at Provincial Crop Protection Lab, 346 McDonald St., Regina, SK S4N 0L1 306-787-8130. All communities are responsible for their own DED surveillance. In Prince Albert, contact the Parks Dept. to have trees sampled. Dutch Elm Disease (DED) has been detected as close as Choiceland. To control the spread of DED firewood with bark must not be transported. American Elms and Siberian (Manchurian) Elms must not be pruned from April 1 to Aug. 31. Infected wood should be burned or buried. No elms wood may be used without a permit. Memberships are now due and can be purchased from Treasurer Keith Dodge. A three-legged tray feeder is being sold for $10. Nov. 16, Karen McIver of Nature Saskatchewan will talk about Important Bird Areas (see naturesask.ca under "stewardship") and Kevin Carr of the Canadian Wildlife Service will talk about Convention on International Trade in Endangered Species of Wild Fauna and Flora (CITES). The fall waterfowl tour was highlighted with the viewing of whooping cranes. It was reported that there were upwards of 40+ in the vicinity. Our group observed 25 in the field and along the shorelines of smaller sloughs. A number of young with light brown markings were noticed. This photo shows whooping cranes accompanied by sandhill cranes. David Stevenson led a field trip for 20 interested mushroom-loving people on September 25, 2010. President Carman Dodge called to order the meeting at 7:30 p.m., welcomed the many guests and introduced the guest speakers, John Thompson of Saskatchewan Archaeological Society, and David Stevenson, a forest renewal expert. He warned against eating any mushroom you cannot absolutely identify. Last Mountain Bird Observatory trip cancelled due to poor weather. Too late in season now.